While wandering through Fleet Farm over the weekend, I stumbled across these: Glacier Glove Alaska River Fingerless Gloves. I've been looking at different cold weather gloves to use for spring fishing, but had trouble finding ones that fit, and didn't cost $50. These fit me perfectly and only cost $15. The palms are supposedly neoprene, the rest windproof and water resistant. We'll see how well they work come March. 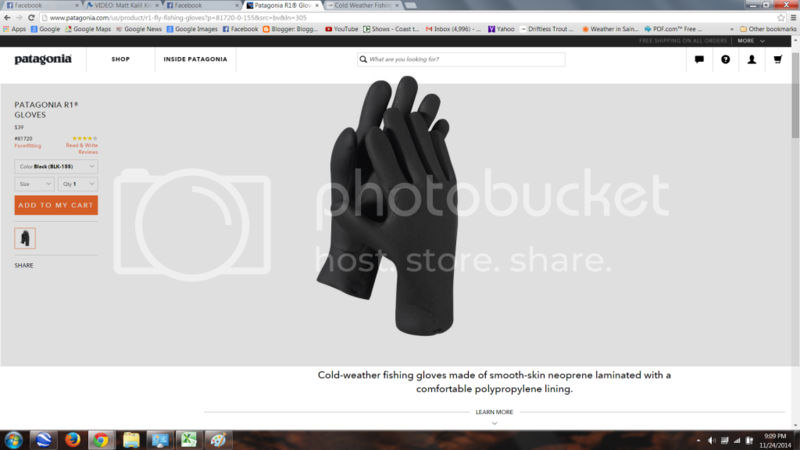 That may warrant a trip to Beaver Dam for me to my nearest Fleet Farm as I am looking for a decent pair of gloves. Of course, I will likely spend more than that on all the fine hunting gear too. When I know my hands stand a chance of getting wet in the extreme cold conditions of spring Steelheading on the Brule I trust the Patagonia R1 Gloves. It helps if you keep a little heat pack tucked in the palm. While they are a little more expensive they are still less than 50 bucks and you get to be like me. Who could ask for more from a glove. I use Kinko Warm Grip #1790-l for colder weather/wet at work and play, all the time. Price at the local Amish farm store is a whoopin $2.50 plus tax. These gloves are very durable. I handle lots of firewood using them. Amish farm store's real name is Irish Ridge Sales. Tell Vernon Yoder I sent ya..
Those Glacier Gloves are OK for about one early season. The non-slip palm surface will peel away and the edges will fray easily. Get's the job done...sorta. I kinda figured they weren't very durable. But I rarely fish more than one or two days in the early season where you need gloves. The big thing is that they fit well. Cabelas makes some nice looking fishing gloves, but they don't fit my chubby hands. I personally don't have these but my brother does and he swears by them. Pretty pricey for a pair of gloves but all the reviews online and from him personally are great. When it comes to keeping my hands warm while fishing in winter, I'll spend the money. I layer fingerless wool gloves underneath The Simms fold over mitts. The Simms fold over mitts. These are the only gloves I have used in the winter. I liked them a lot the first season, less and less every season after. They wore out quickly on me. When they are new, they do a spectacular job keeping the wind out though. Even still, I don't think I can recommend them for the price. A little too much information there Kyle. That kind of talk might be more appropriate on another board.